It’s a dark, drizzling day in New York and we have cassoulet on the brain, natch. The hearty, bubbling bean stew is the perfect antidote to chilly, wet weather. Always made in a large batch, cassoulet is the perfect dish for sharing with friends and makes a great excuse for an Autumn get-together. Our cassoulet recipe kit has all of the D’Artagnan ingredients needed – and you probably have the rest in your fridge/pantry (onion, carrot, celery, garlic, a few herbs, and tomato paste). Did we mention the kit is 15% off, right now? (tee, hee!) Just be sure to have plenty of robust red wine and some crusty, country bread on hand for sauce-sopping. Then after a few glasses of vin, during the warm & comforting feast, treat your guests to a little cassoulet trivia. 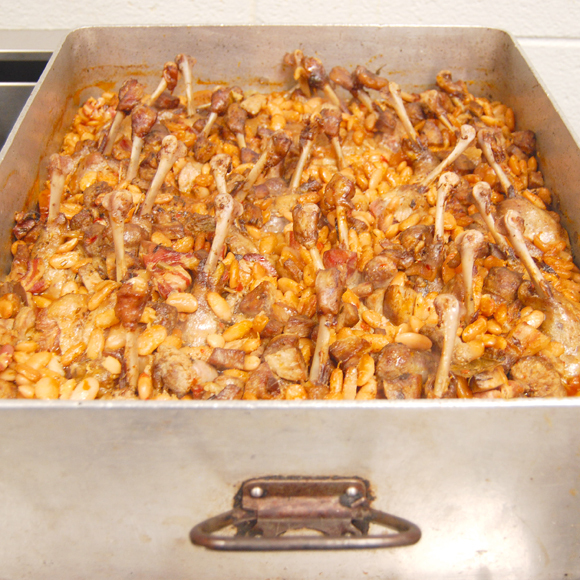 Our article on The History of Cassoulet will give you all the info you need to impress with your cassoulet acumen. Keep reading for our full, fool-proof recipe – with bonus tips from Ariane. Here’s a GIANT cassoulet, made right here in the D’Artagnan office for staff lunch. 1. 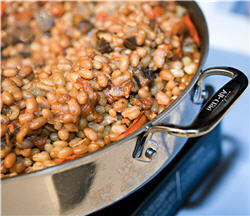 Add beans to a large, non-reactive container(s), cover completely with water and soak overnight at room temperature. Keep water level several inches above beans. Check back every so often as beans will absorb a lot of water. Use a few separate containers if necessary. 2. Drain beans, put into a large, heavy pot with whole ventrèche, garlic, carrot, bouquet garni and onion that’s been studded with cloves. Add enough water to cover at least 3 inches above beans. Bring to a boil over medium-high heat then reduce heat to low and simmer, stirring often, until beans are barely tender, about 1 hour. 3. Drain beans, discard onion and bouquet garni. Remove ventrèche, cut into ½ inch squares, set aside. 4.Season beans with 1 teaspoon salt and several grindings of pepper. 6. In a medium skillet over high heat, sear duck and Armagnac sausages until just browned. Remove from pan, cut into thirds and set aside. 7. Lightly grease large casserole, preferably earthenware or enameled cast-iron, with duck fat, on both bottom and sides. Place half of the bean mixture in casserole. Add duck legs, browned duck sausages, chopped ventrèche, and sliced garlic sausage. Drizzle with duck fat. Cover with remaining beans. 8. Stir tomato paste into demi-glace and 3 1/2 cups of water, mix well until dissolved. Pour evenly over bean mixture. Drizzle with remaining duck fat. 10. Increase (or preheat) oven to 400 degrees F. Uncover casserole and bake until top is browned, about 45 minutes. If at this point, cassoulet is not heated through, cut open the crust, pour ½ cup of water and/or demi-glace, and continue to cook until hot all the way through. 11. Serve immediately. Each guest should get an equal proportion of beans to meats. Don’t hesitate to open the crusty top to make sure the cassoulet is not drying out. The texture should be similar to a thick stew. If it seems too dry or pasty, add some liquid, such as stock, demi-glace or even water. Typically, you’ll have to cut the crust and add liquid about 3 times before it’s hot all the way through. Some cooks in Gascony think cassoulet will only be ready after 7 times of breaking the crust and adding liquid! A hearty, red wine from Gascony is always a good match for cassoulet. Try Madiran or Cahors.